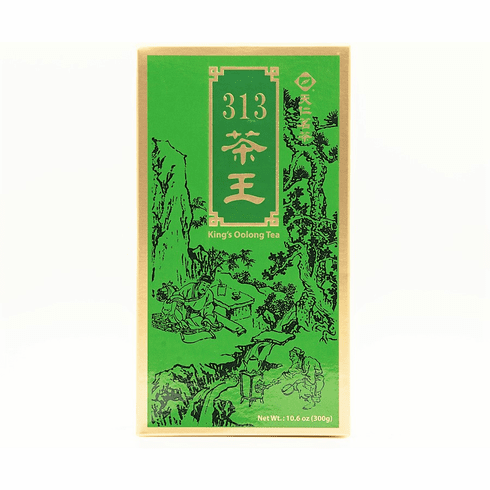 Ten Ren's King's Green Ginseng Oolong 2nd Grade consists of very fine oolong harvested during the premium seasons, spring and winter, and from the best area to grow oolong, the mountains of central Taiwan. The leaves are then blended with a touch of ginseng to create an incredible aftertaste. Each tea leaf is handpicked to ensure harvests of young terminal buds. The steeped tea has a light green hue, sweet flora aroma with roasted undertones, moderate tartness as the initial flavor, and a sweet, pure aftertaste which lasts after the sip. The water used to steep this tea should be about 185-195�F or 85-90�C. Use about 2 teaspoons (3 grams) of tea leaves for about every 5 ounces (150 milliliters) of water. A steeping time of about 3-5 minutes is recommended with more or less time depending on the desired concentration. As a rough guide, the higher the temperature of the water or the greater the amount of leaves used, the shorter the steeping time should be. The tea leaves should uncurl for full flavor. For the ultimate enjoyment, a traditional Chinese Yixing teapot is recommended for loose oolong tea. The teapot should be half filled with leaves and initially steeped for 45 seconds to 1 minute with the steeping time increased by an additional 15 seconds for each successive steeping. The leaves may be steeped multiple times.